The Pan American Bank building is the headquarters to for the oldest Latinx-owned bank in California and was co-founded in 1964 by Romana Acosta Banuelos. 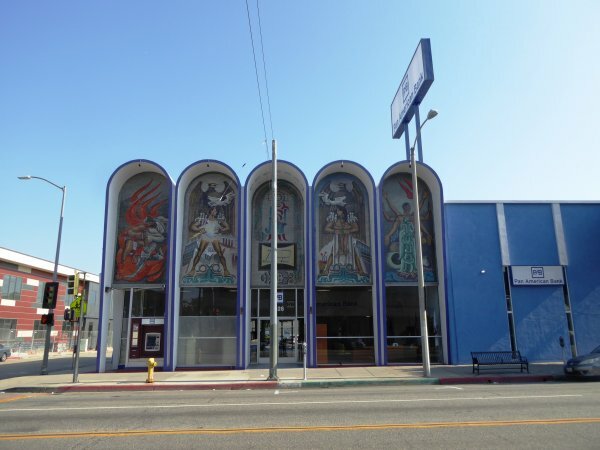 The National Parks Service (NPS) has added the Pan American Bank structure in East Los Angeles to the National Register of Historic Places, recognizing the structure for its important role in the social history of East Los Angeles’s Latinx community. The Pan American Bank building is the headquarters to for the oldest Latinx-owned bank in California and was co-founded in 1964 by Romana Acosta Banuelos, the first Latina Treasurer of the United States. The bank, still in operation, has served as a vehicle for commercial and economic development in East Los Angeles’s Latinx community for generations. The New Formalist-style bank building was built between 1964 and 1966 and designed by architect Raymond Stockdale. Most strikingly, the two-story, steel-reinforced masonry structure features a series of five archways at its main entrance. The groins the arches are decorated with a series of narrative mosaic murals designed by Jose Reyes Meza that are inspired by the history of the Mesoamerican peoples and depict various Mesoamerican motifs, including religious and celestial iconography. See here for the structure’s National Register nomination. The structure was nominated to the National Register using Underrepresented Community Grants funding provided to the Los Angeles Conservancy in order to “support the survey, inventory, and designation of historic properties that are associated with communities currently underrepresented in the National Register of Historic Places and among National Historic Landmarks,” according to the NPS website. The California Office of Historic Preservation—a public entity responsible for administering funding for federal- and state-level historic preservation programs across California—distributed funding to the project as part of a larger set of grants aimed at supporting National Register nominations for structures and sites associated with Latinx history in the cities of Fresno, Los Angeles, Riverside, and San Francisco. The move for increased diversity among the NPS’s recognized sites comes amid efforts to boost levels of non-white visitors to National Parks and other sites. Among funding initiatives like those described above, the NPS also announced a series of National Historic Landmarks earlier this year aimed at preserving sites important to Civil Rights and indigenous cultures.